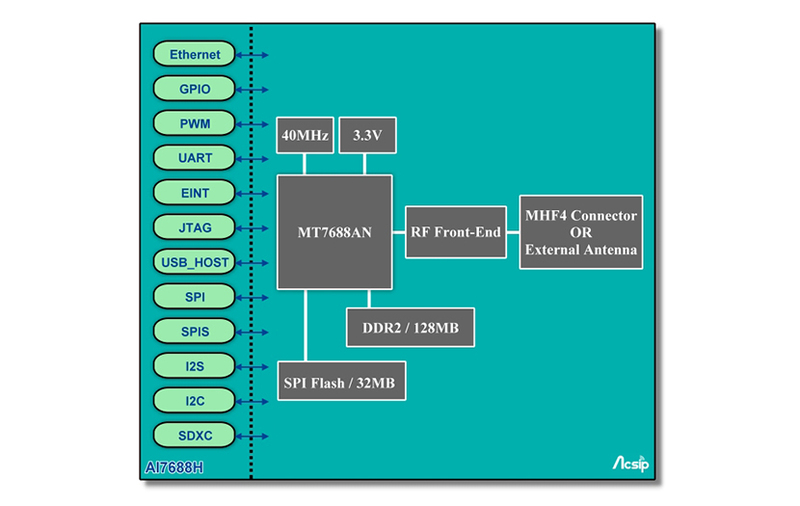 AI7688H is a Linux, Wi-Fi, SOC, open development platform based on the OpenWrt Linux distribution designed to enable the prototyping of IoT devices. These devices include Wi-Fi security web cam and sensors for the home or office, real time camera monitor for toddler and seniors as well as cloud-based applications. AI7688H provides generous memory and storage to enable rich application developments. The platform also offers options to create device applications using Python, Node.js or C.
Do you have a real data sheet? The Product Brief V01 linked under Documents is just two pages and even lacks a dimensional drawing, hence making it impossible to create a proper PCB footprint. SOrry,please go to the new website ##http://www.acsip.com.tw/index.php?action=technical##Regards! What about something like an eagle footprint or just the drawing of the pads? This is a third party Module. So, Please contact to http://www.acsip.com.tw/index.php?action=contact.